The unending march to bring the Internet of Things into all the things continues. While CES 2015 gave us a sneak peek at the near- and long-term future of the IoT movement, there are plenty of WiFi-connected options available today. We've already taken a close look at the Belkin Crock-Pot Smart Slow Cooker with WeMo (phew!). Now it's time to see how useful a smart coffeemaker can be. The official name here is also a mouthful: It's called the Mr. Coffee Smart Optimal Brew Coffeemaker with WeMo. Essentially, it's an upgraded version of the company's $90 Optimal Brew Thermal Coffeemaker, a thoroughly non-WiFi model that shares the same chrome-heavy exterior. In fact, the only real difference between the two may be the WiFi module in the upper-right corner that replaces the cheaper model's clock and various buttons. The hardware feels fairly upscale as far as consumer coffeemakers go. Every removable part reinserts with a satisfying thud, save for a cheap-feeling reservoir cover that just sits on top with only gravity holding it in place. The double-walled, stainless steel carafe keeps its contents suitably warm for several hours in the morning. Even an eight-hour-old pot of coffee still carried a hint of warmth to it. It's a cleanly designed device, though its shiny exterior may be a magnet for greasy fingerprints. Aside from a brew button and a small reset toggle, there's not much you can control directly from the coffeemaker. 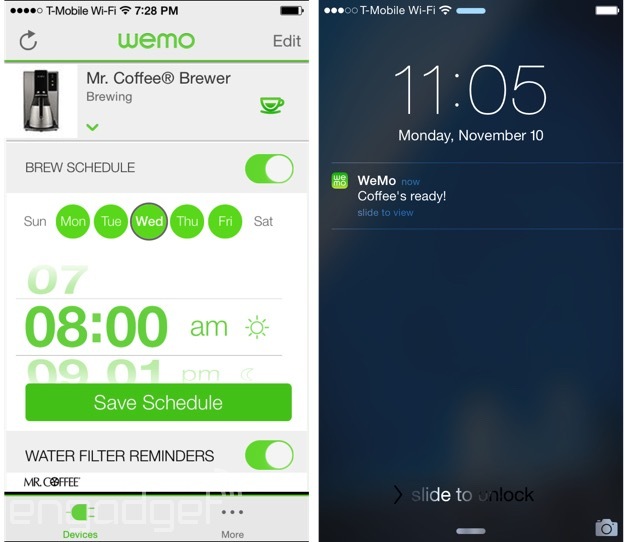 All the scheduling and reminders are handled via the WeMo app for iOS, Android or Amazon Kindle. Connecting to the coffeemaker is fairly straightforward. 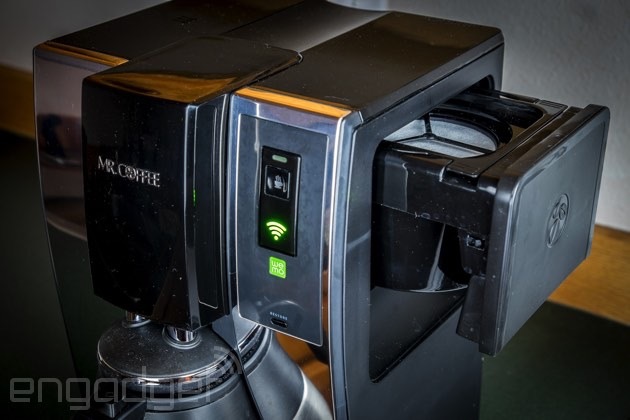 Like the Smart Slow Cooker, the coffeemaker offers up its own WiFi network. All you need to do is connect to it on your phone or tablet and then fire up the WeMo app. From there, the coffeemaker will connect to your regular home network and then you're ready to start smart brewing. It's the same overall app we've detailed in the past, but selecting the Smart Coffeemaker from the menu gets you a few device-specific controls. Scheduling brew times from the app is as simple as selecting a day and setting a time. If you're ever set a calendar appointment on your phone, you can handle this. The day-to-day timing comes in quite handy if you've got a variable workweek and don't always start the day at the same time. And if you choose to sleep in a little longer or call in sick, delaying or canceling a brew from the bedroom definitely beats the groggy, zombie shamble across the house to manually adjust the coffeemaker. There are other plusses to a WiFi-enabled coffeemaker. The app can send you notifications the night before if you forgot to refill the water or neglected to return the pot. It will also remind you to replace the water filtration disk at the appropriate time -- something I guarantee I would never remember on a standard coffeemaker. Conceivably, you could set your coffeemaker to brew on the way home from work, so you have a fresh pot of decaf waiting for you when you get home. Of course, all these options for remote brewing and flexible scheduling work best if you're proactive enough to refill the coffeemaker after using it. As a dedicated AeroPress user, though, it took me a solid week before I could condition myself to remember to stock up the coffeemaker before heading to bed. Those evening reminders, then, are certainly a nice touch. Overall, remote controls and some handy reminders may not be enough to justify the Smart Coffeemaker's $250 asking price, though it's currently seeing discounts down to about $150 -- roughly $60 more than its non-WiFi stablemate. Still, I don't see myself paying that much to get my drip coffeemaker hooked into the Internet of Things. If Belkin and its hardware partners can chip away at the costs involved, maybe someday choosing a WiFi model will be a no-brainer. As it stands, though, a $60 premium seems too steep for some nifty conveniences.